A lot of stuff happened and I didn’t post for a while.It seems in the mean time that Corvus Belli decided that Yu Jing was the only faction that matters and everyone else is just NPC races. There’s a lot of catching up to do and the rebooted Su-Jian is great place to start! The Su-Jian underwent a complete redesign that I think fabulously portrays him as heavy infantry with remote presence rather than a remote. He is humanoid in his combat form, but the proportions are still bestial. He shares some design elements with existing heavy infantry (and the Guijia!) so he looks right at home with his team mates, yet there is no mistaking him for one of them. The new Spitfire + light flamethrower design is also excellent. I love this model. There is of course, more than one model to love. The mobility form (AKA BEAST MODE) version is completely radical. Apparently the idea of felid remotes for Yu Jing existed a long time ago, but this still caught me completely by surprise. If someone told me the Su-Jian was becoming a mechanical cheetah I almost certainly would have said “That’s stupid”, so I’m kind of glad it did. It just looks powerful. 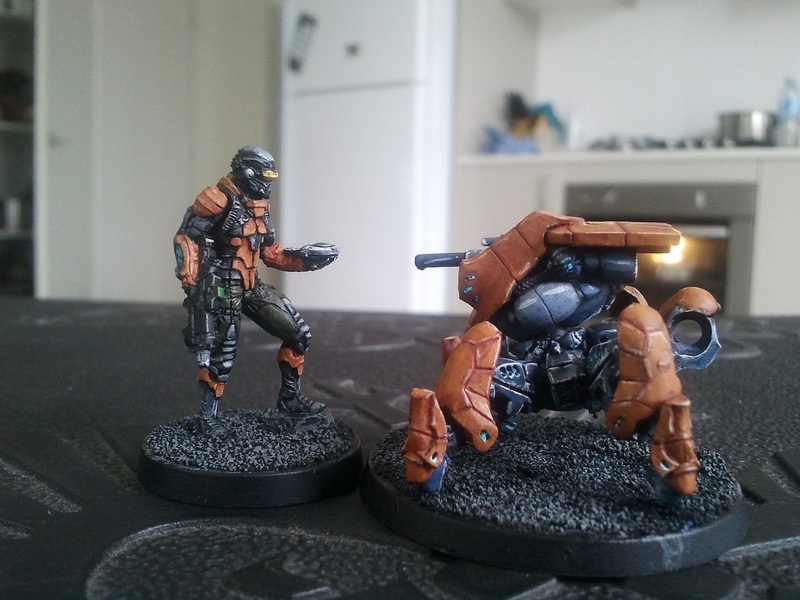 When the preview dropped, Javier G. Urena, the digital sculptor for many of Infinity’s most amazing models, including the majority of Yu Jing, attended to many questions about the design which was enlightening. They put a lot of effort into making the transformation plausible. For instance the knife folds back on the forearm and you can see it stowed in mobility form. He was predictably bombarded with questions about the tail, which apparently collapses in on itself an folds into a hatch on the oversized codpiece when not in use. Not content with simply producing a massive redesign, Corvus Belli also revisited the stats of this literal killing machine. This included jacking up it’s armour, BS and giving it No Wound Incapacitation, unprecedented on a unit with remote presence. I love this company. Also, painting both forms was a real breeze once I finally got back on the horse after I think 4 months. There is only really two types of surfaces, armour plates, which I did in orange (thankfully I wrote down the recipe somewhere), and the muscle layer which is all grey. 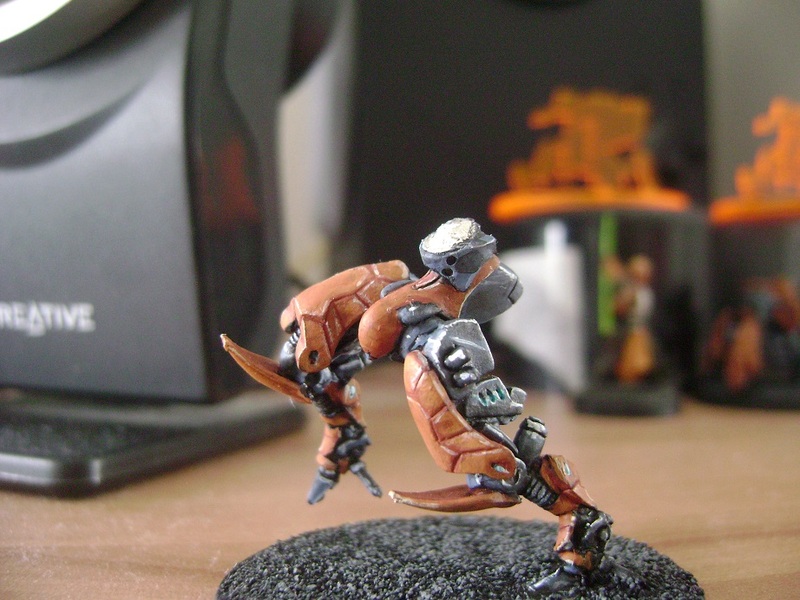 I left the knife arm off mobility form when I painted the model so I could reach the belly. If you want to read more about the name of this unit, how to pronounce it and what it means, check out this article from when I did up the original Su-Jian. Oh, the Su-Jianity! Part 4. The long awaited and thrilling conclusion to the accidentally extended Su-Jian saga. I finally got my hands on a pin vice and some micro drill bits. I used a paperclip to make the pin. I was actually able to drill the painted model without doing too much damage by using spare blister pack foam to hold the model when adding resistance. It was easier than I imagined to get a good alignment as you can bend the pin once you start fitting the model together. I’ve learned a valuable lesson. Sometimes glue is not enough. If you want to add one of these bad boys to your collection, you have to be ready to pin him. Oh, the Su-Jianity! Part 3? Been a long time since I updated. It’s because I am still trying to source a good value pin vice. Why you might ask? Oh, the Su-Jianity! Part 2. Well, that was intricate. Don’t think I’ve needed that much time to paint a single figure before. At least it’s done now. 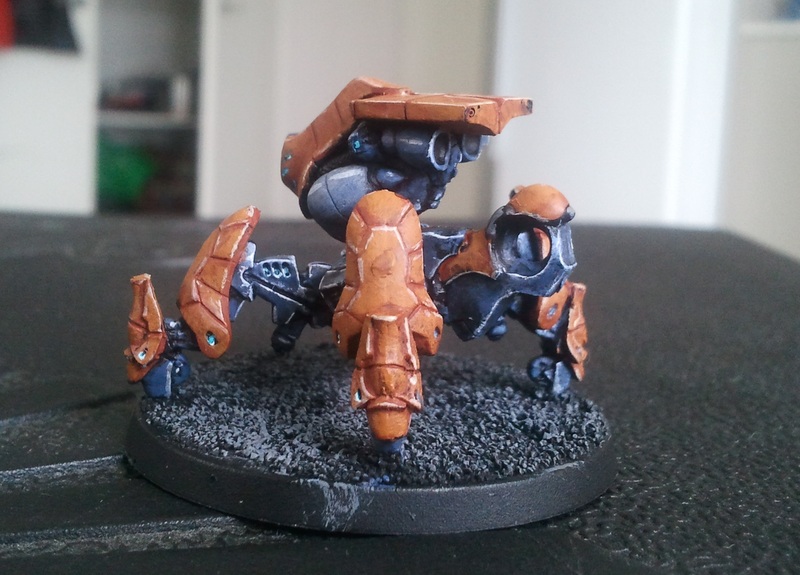 I’m glad Infinity is a skirmish war game, because I would not want to assemble and paint another. That said, the effect is awesome. What a cool robot. 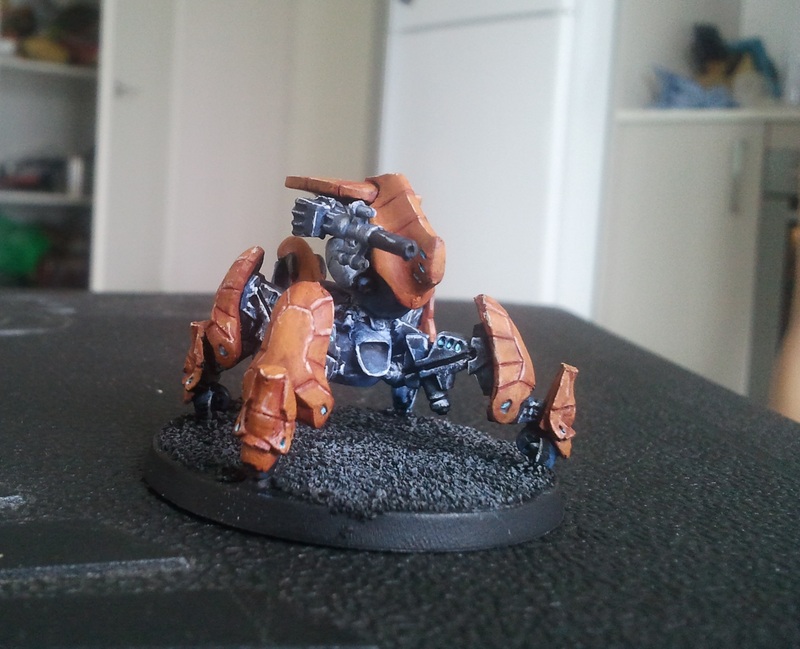 It was a simple model in terms of painting, there’s only really 4 kinds of surfaces aside from the base. Armour, light structure, dark structure and lights. I painted them all the same as his mobility form to try and pass them off as the same trooper. Access was the real pain, it’s not a good idea to invert this thing to get at hard to reach places. I learned that the hard way. Either paint it in pieces deliberately, or you will be painting it in pieces by accident. Now, onto the name. The unit description on the old website, which is the same as in the Human Sphere book, says Sù-Jiàn means swift sword (I’ll paste the whole bio after because it is cool). From that we can work out the characters are “速剑”. The first character, 速/Sù, can function as a noun for speed itself, or can be used as an adjective, as is the case in this unit’s name. To pronounce it, take the word “tool”, take away the ‘l’, then turn the ‘t’ into an ‘s’. You should be bang on the money. 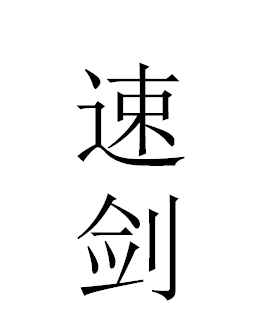 The second character, 剑/Jiàn, usually denotes a specific kind of sword, that being the iconic Chinese double-edged straight sword, which is often used in Wushu and Taiji. It’s pronounced as a single syllable not unlike “j’yen’. You can see that is is spelled similar to and rhymes with 天/Tiān，the character that features heavily in the Celestial Guards. As a recent creation, pinyin is internally very consistent, which is good news for anyone trying to learn.The tones are a little different but I am not going to try and convey tones over the internet, seeing as I struggle in real conversation. […] The Sù-Jiàn Program is the jewel in the crown of Yu Jing’s military industry. 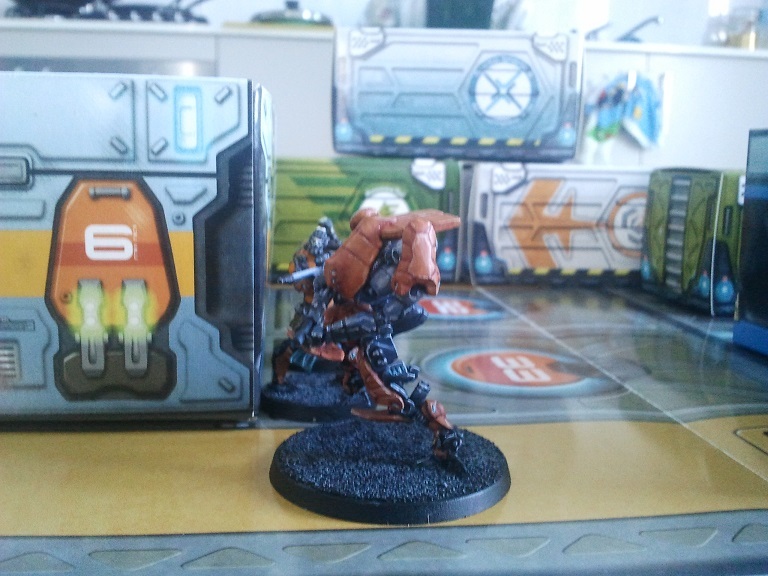 A Remote Presence Heavy Infantry with variable morphology. 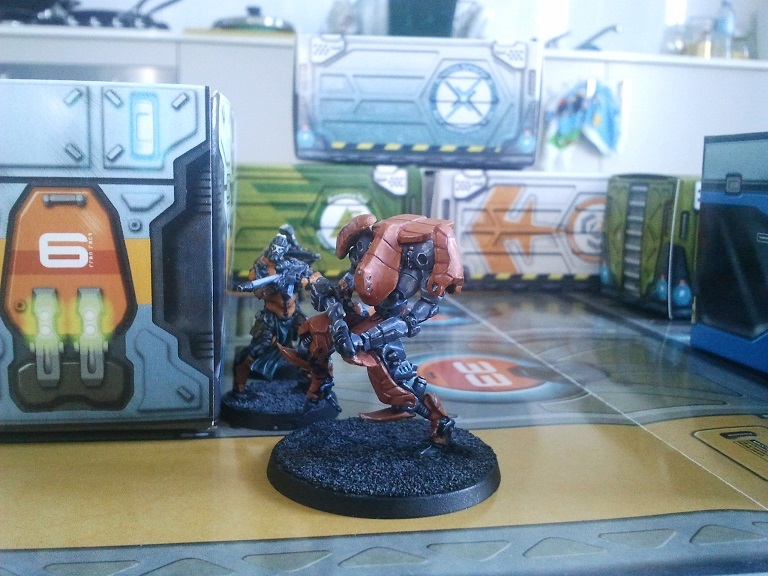 The key to its success is the integration of Remote Presence technology, the supposedly PanOceanian great achievement, into Yu Jing’s military specialty: its famous Heavy Infantry armor. Usually, servo-powered armors are slow and heavy, while what was sought was the opposite, nimbleness and mobility. To that end, instead of creating and developing hardware improvements, it was decided to remove the human operator. After the achievements in terms of hardware from the Karakuri Project, it was necessary to go beyond them and create a precise interface able to reflect quickly and exactly the movements and intentions of its remote operator. The pilot had to become his own armor. For this purpose, it was vital that the remote interface allowed a direct connection with its operator. 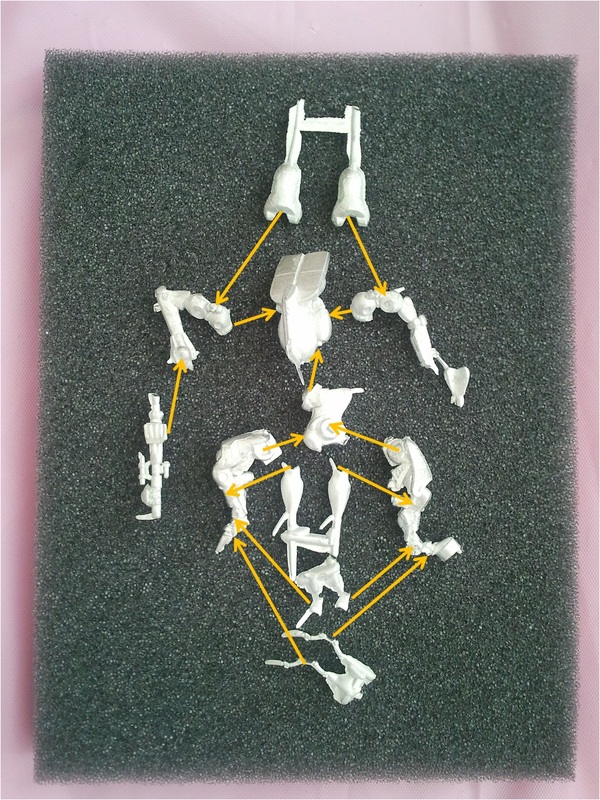 New neural connections had to be created that would work within the reduced space of a human sized exoskeleton. - Fragment of “Jì Shù Jīn Rì” (Technology Today) Educational broadcast from the Information Ministry, StateEmpire of Yu Jing. - Fragment of “The Future of War” Broadcast no. 93. Program from the military entertaiment channel Sabot! Only in Maya. - Sergeant Yin Wenbo, Sù-Jiàn Unit. Interview for Diàn Guāng (The Lightning) channel. Exclusive broadcast in the Yu Jing territories’ Maya net. - Non-commissioned instructor officer Zheng Tāo. Sù Jiàn Unit. Special Training Centre of Cheng Tû, Prefecture of Zhî Tû, Yutang, Yu Jing. Here’s how I imagine all that might look. I had been day dreaming about that for a while now. Putting the two models side by side doesn’t really convey what the Sù-Jiàn is all about. Maybe my blurry montage can better convey the dynamic nature of the trooper presented by the unit description. 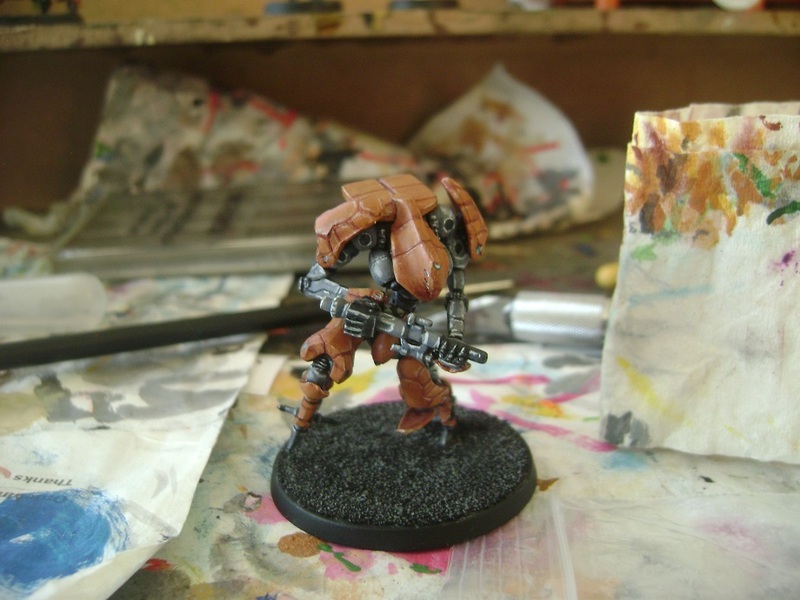 A while ago I mentioned the Su-Jian as being one of the units that got me into Infinity, let alone Yu Jing. When my remotes shattered and I nabbed a proxy Sophotect to help me patch them up it seemed like the time was finally right to add one to my collection. Of course this would mean assembling the notoriously fiddly sculpt. 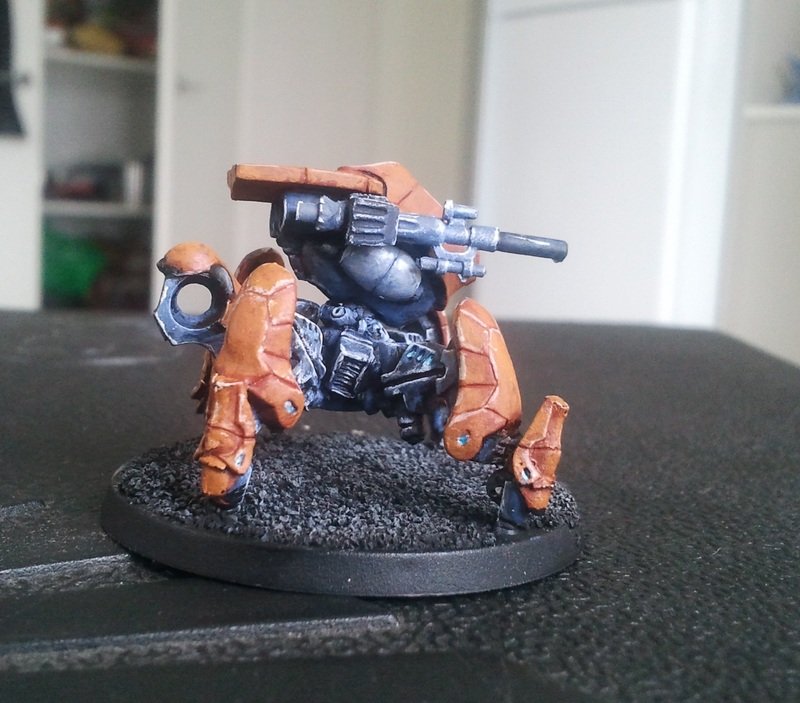 Luckily the mobility form was easy enough to assemble then paint. 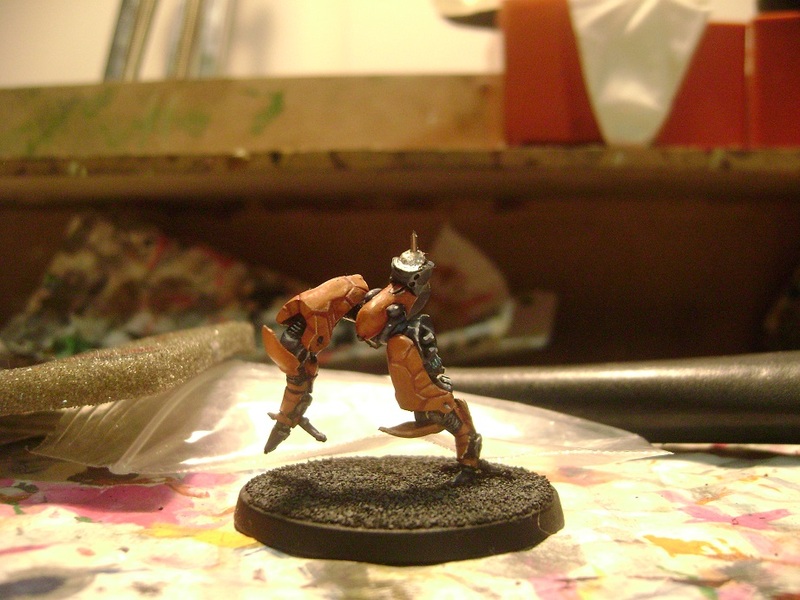 The metal bits were done in the same manner as my Authorized Bounty Hunter, but with heavier washes. 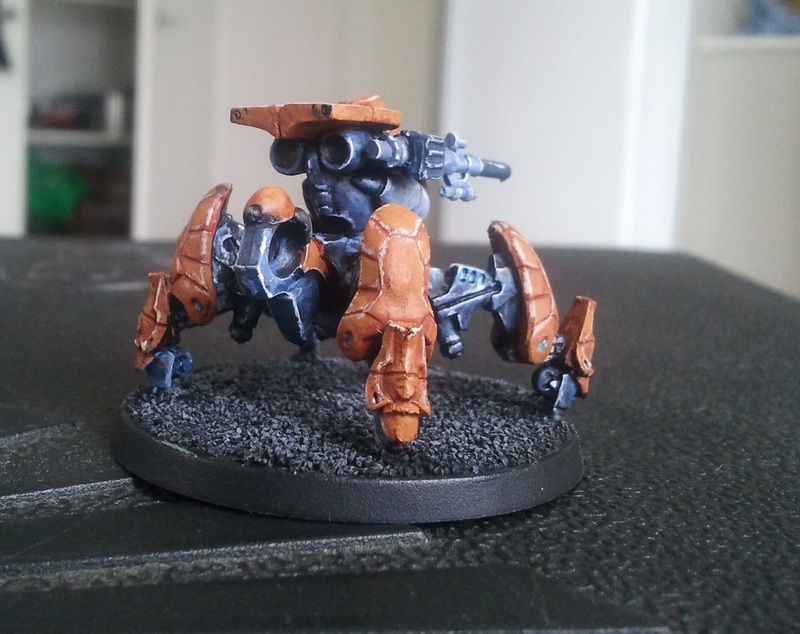 The armour was painted the same as my Celestial Guard Hacker. Stay tuned as I attempt to get the Combat Form up and running during the week.